One of our fave foxgloves, this (sub)shrubby species forms large spreading plants with multiple spikes of the most amazing flowers. 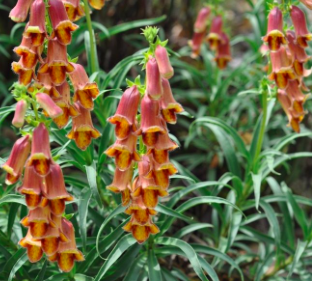 2′ spikes support tubular orange flowers with an interior of russet brown and more intricate markings. An excellent candidate for hot sunny slopes as it is native to the Iberian peninsula. Full sun, well drained soil and light summer moisture. Reseeds happily in open disturbed sites and those seedlings can be dispatched, moved, or shared with friends. Spectacular flowers appear in spring and continue into summer. High deer resistance. Average lifespan of an individual plant is 3-5 years. Dry borders, gravel gardens, exposed areas with voracious deer. Wonderful plant.